Red looks to rescuing Hansel and Gretel in Hoodwinked Too! Anchor Bay Entertainment and The Weinstein Company released the animated pop cultured-filled family comedy Hoodwinked Too! Hood Vs. Evil on Blu-ray 3D, Blu-ray and DVD on Aug. 16, 2011. 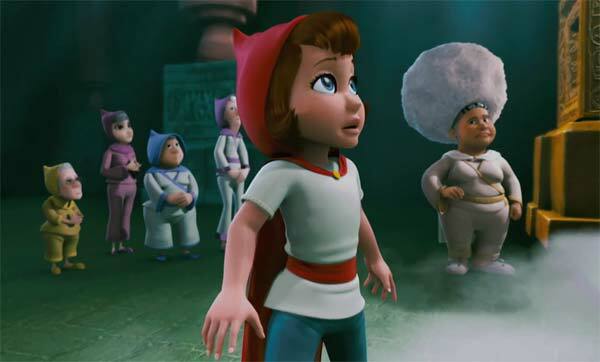 Like the original 2005 movie Hoodwinked!, the sequel is based on the classic Red Riding Hood fairy tale and features an all-star voice cast. The directorial debut of Mike Disa, the movie finds our heroine Red (Hayden Panettiere, Amanda Knox: Murder on Trial in Italy) getting called into action by Nicky Flippers (David Ogden Stiers, Beauty and the Beast), the head of the secret Happily Ever After Agency (HEA). He needs Red and the whole Hoodwinked gang — Red, Granny (Glenn Close, The Natural) and the Wolf (Patrick Warburton, TV’s Rules of Engagement) — to look into the case of a wicked witch (Joan Cusack, Mars Needs Moms) who has abducted two innocent children who go by the familiar names of Hansel (Bill Hader, Cloudy With a Chance of Meatballs) and Gretel (Amy Poehler, TV’s Parks and Recreation). Released wide to more than 2,000 theaters in early May 2011, the PG-rated movie rang up a disappointing $10 million at the box office, a far cry from the original film’s $52 million gross. The Hoodwinked Too! Hood Vs. Evil was made available for the list price of $39.99 for the 3D Blu-ray 4 Pack , which includes a Blu-ray 3D, Blu-ray, standard definition DVD and digital copy of the film; $34.99 for the Blu-ray/DVD Combo Pack ; and $29.98 for the standard definition DVD .